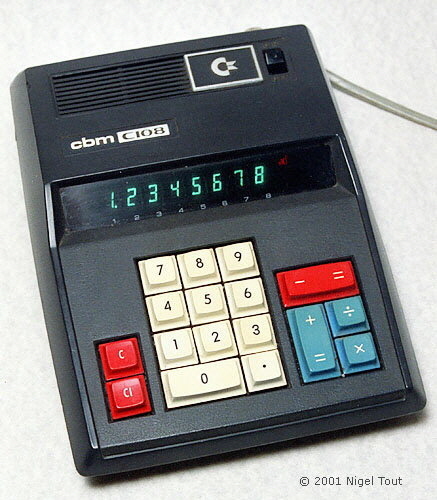 The Commodore C108 and the Adler 804 were among several ground-breaking four-function calculators, due to their low cost, which were based on three-chip MOS chipsets from Omron into which was squeezed the calculator functionality. Although produced for Omron the chipsets were manufactured by Nortec Electronics and Hitachi, respectively, and Omron sold the chips on OEM circuit boards to other calculator manufacturers. Distinctive features: An early small, low-cost, calculator. Display: 8 digits, separate green vacuum-fluorescent tubes. Technology: Large Scale Integration (LSI) chips - Omron ALPHA1, ALPHA2, ALPHA3, here date coded mid-1971. The chips also carry the letters "NE" indicating that they were manufactured by Nortec Electronics for Omron. Size: 172 x 226 x 61 mm (6.75" x 8.9" x 2.4"). 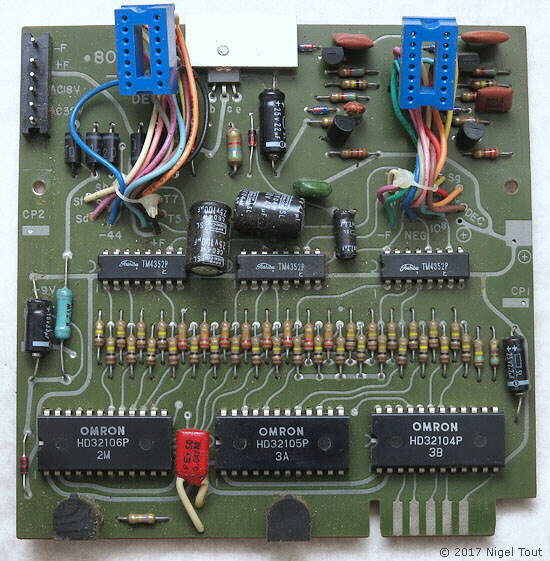 The main electronics board, at least, was made in Japan by Omron Tateishi Electronic Co. for Commodore (also known as Commodore Business Machines, cbm). The casing and keyboard of the machine may have been manufactured elsewhere, and also assembly may have been by a third too. Significance: This machine uses the Omron "Alpha" calculator chipset with the whole functionality of a four-function calculator squeezed into three MOS integrated circuits. This allowed a very low-cost calculator to be produced. "Electronics" journal in April 1971 announced "The latest price cut in the hot electronic desk calculator battle was announced by Omron Tateishi Electronic Co., which will start selling an eight-digit unit for $138 in Japan next month. The new machine will be sold in the U.S. by Commodore for $199.95 [about £84 GBP]. The new calculator is designed for line operation [AC] only. It's built around three MOS/LSI chips that Omron Tateishi claims were designed by its California subsidiary, Omron R&D, and fabricated by an undisclosed U.S. IC manufacturer." The U.S. manufacturer was later named as Nortec Elctronics, Santa Clara, California. The use of LSI (Large Scale Integration) integrated circuits drastically reduced the electronics components required in a calculator, which led to a much lower assembly cost and lower selling price. 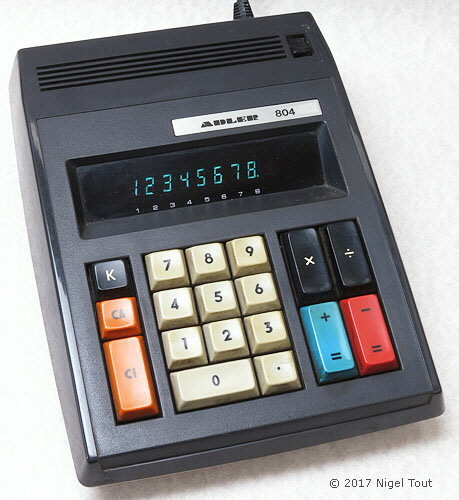 The small number of components also allowed the calculator to be compact, and apart from the very simple keyboard and use of separate display tubes this machine could easily be mistaken for a later model of the mid-1970s. Calculators using the same chipset were sold by Citizen and Omron itself. For further information about the development of the ALPHA chipset used in this machine see towards the bottom of the page http://www.oldcalculatormuseum.com/d-victor3900.html. The circuit board of the Commodore C-108 showing the three Omron LSI (Large Scale Integration) "Alpha" integrated circuits, requiring few other components. Close-up of the OMRON "ALPHA" chipset in expensive ceramic packages. Note on each the letters "NE" before the date code – this indicates manufacture by Nortec Electronics. Display: 8 digits, blue-green vacuum-fluorescent display (VFD). Technology: Large Scale Integration (LSI) chips - Second generation Omron MOS LSI three chip chipset manufactured by Hitachi, in plastic packages. The machine is labelled "T-A Vertriebs-GmbH 85 Nürnberg" – That is the Triumph-Adler company of Germany. Significance: This machine uses the OMRON second generation three chip calculator chipset, this time manufactured by Hitachi and using plastic packaging, which allowed an even lower cost calculator to be produced. 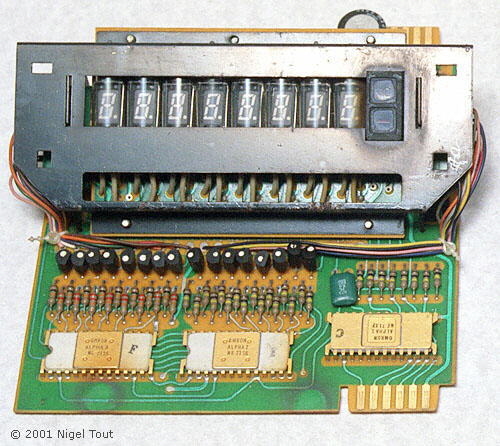 The small number of components also allowed the calculator to be compact, and apart from the very simple keyboard and use of separate display tubes this machine could be mistaken for a model of the mid-1970s. 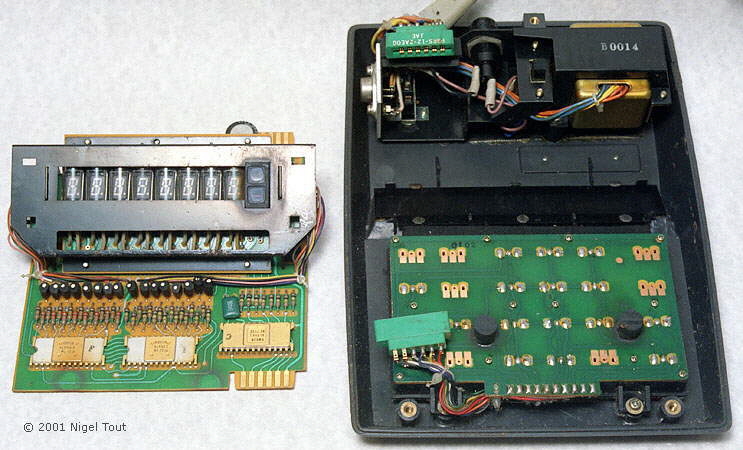 The Adler 804 with the bottom of the casing removed and the main circuit board partially unplugged. The early vacuum fluorescent display (VFD), left of centre, is unusual since it's rear has a dual-in-line connector at each end, to take the two blue dil sockets. The main circuit board of the Adler 804 with the second generation OMRON chipset, manufactured by Hitachi. They carry Hitachi part numbers and here are date coded to late 1972 and early 1973. "International Newsletter", Electronics, April 26, 1971. "The Victor 3900 - History's Forgotten Miracle", http://www.oldcalculatormuseum.com/d-victor3900.html, near the bottom of the page.